SPEEDWAY, Ind. (May 19, 2017) – Oriol Servia, representing Palm Beach Driving Club, moved up to eighth on the speed charts in Indianapolis 500 practice on Thursday. Servia, driver of the No. 16 Rahal Letterman Lanigan Honda, ran 74 laps around the famed 2.5-mile Indianapolis Motor Speedway and posted a top speed of 224.837 mph. 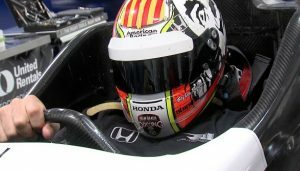 Servia, who is sporting the Palm Beach Driving Club logo on his helmet for a second straight year, is attempting to make his ninth start at the Indianapolis 500. The veteran driver said there are always challenges racing at the track which first opened in 1909. Servia finished 12th in the 2016 Indianapolis 500 as a representative of PBDC. The pre-eminent members-only club for automotive enthusiasts in the United States is located at Palm Beach International Raceway in Jupiter, Florida. The 101st running of the Indianapolis 500 is set for May 28, with coverage beginning at 11 a.m. EDT on ABC, and the Indianapolis Motor Speedway radio network.